Walnut armchairs, newly finished and upholstered in linen. They have an Italy stamp and an illegible signature. 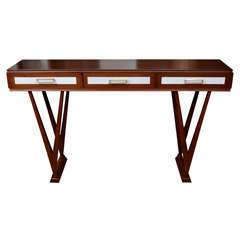 Travertine and marble console with glass inset on bottom. Beautiful brass console from France. 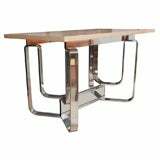 Designed in the 1950s with the original 1/2" black tinted glass top which sits on two brass bars across the base. Interesting serving or bar car, attributed to Cesare Lacca. The top two trays re removable to serve your guests drinks etc. 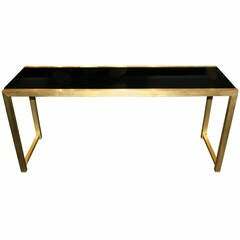 Wood with brass trim and accents. 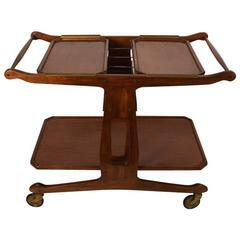 Bar cart with two removable trays with glass shelves on castor wheels, attributed to the Italian designer Cesare Lacca. Bar cart on castors with three glass shelves and a smooth wooden frame, attributed to Cesare Lacca. 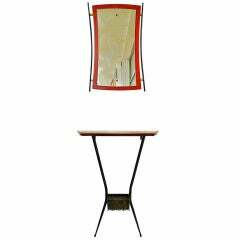 Attributed to Cesare Lacca dry bar trolley, circa 1950s. 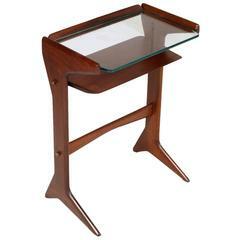 1950s console bedside table Cesare Lacca Mid-Century Modern, in mahogany with glass top. 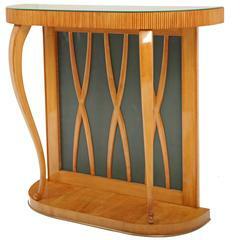 Italian console table, attributed to Osvaldo Borsani. Typical S-shaped legs on a semi-circular stand. The backwall is painted in green and decorated with crossed wooden sticks. 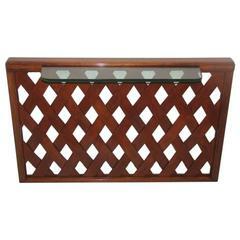 Italian design console attributed to Paolo Buffa design, especially wooden console shaped network with glass shelf often recessed.